Theodore's World: More From ANTI-American Mikey Weinstein 's (Military Religious Freedom Foundation) Says Army Symbol Is Religious, Should Be Changed ~ WTF! More From ANTI-American Mikey Weinstein 's (Military Religious Freedom Foundation) Says Army Symbol Is Religious, Should Be Changed ~ WTF! The Military Religious Freedom Foundation asked the Army this week to change the emblem of Evans Army Community Hospital at Fort Carson, outside Colorado Springs. Fort Carson commanders will review the complaint, Lt. Col. Steve Wollman said. He said the emblem had been approved by the Army Institute of Heraldry and has been in use since 1969. Wollman said references to doctors serving God and humanity date to the time of Hippocrates, a pre-Christianity Greek physician. Wollman said the cross, which has a pointed base, is both an emblem of mercy and a symbol dating to the Middle Ages, when pilgrims carried a cross with a spiked base to mark the site of a camp. Mikey Weinstein, president of the Military Religious Freedom Foundation, said that's a reference to the Crusades and could embolden U.S. enemies who want to portray the war on terror as a Christian war on Islam. "This continues to add more fodder to the argument that we are Crusaders," Weinstein said. "It's exactly what fundamentalist Muslims want." Weinstein's foundation, based in Albuquerque, N.M., last week persuaded the Army to withdraw an invitation to evangelist Franklin Graham to speak at the Pentagon on May 6, the National Day of Prayer. What a total POS this Mikey Weinstein is. What's wrong Mikey and what the F kind of name is that for a grown man....oops sorry guess that was a strectch huh Mikey to call you a MAN! Mikey Weinstein.... muzzy sympathizer! God will judge America and it won’t be pretty. I truly fear for the future of our beloved America. These people on the left are tripping our country from our heritage - one piece at a time! 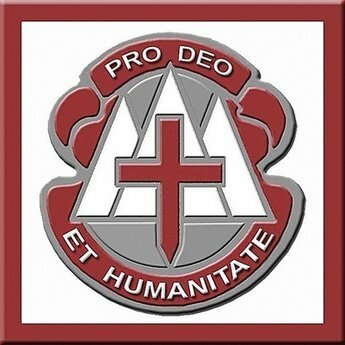 The motto of Fort Carson’s 10th Combat Support Hospital is “IN CRUCE VINCAM” which translates to “I Shall Conquer By The Cross”. And the CSH’s distinctive unit insignia has two *gasp! * crosses on it (one maroon and one white). That would really make their heads explode! "...constitutional requirement for separation of church and state..."
There is no separation of "church and state" in the Constitution. It does forbid the creation of a state religion (such as the Church of England). The language of the First Amendment says that Congress will not pass any laws regarding the establishment of a religion. That means that the Federal government (and now the states) may not create an established religion. An established religion is one that is favored above others through financial and other support that is not available to other religions. For example, the Church of England is the established religion of Great Britain. It receives financial support from the State. The 26 most senior Bishops (including the Archbishops of Canterbury and York) sit in the House of Lords and vote on legislation as a right of their position in the Church. That is an established religion. We do not have an established religion in the U.S. Putting up a cross on public land to commemorate war dead or “In God We Trust” on our money isn’t creating an established religion either. Mikey Weinstein can go take a flying leap! I'm sorry. The Church of England is not the established religion of Great Britain; it is the Established Church in England. And it does NOT receive financial support from the state. They are sending this country to hell in a handbasket. I would hope the Army won't cave in on this but I suspect they will as direction for the Pentagon will dictate their course of action. What happened to Franklin Graham should be a wake-up call on what is taking place in the Pentagon. Also, I'm hearing that Graham wasn't the only minister disinvited by the Pentagon. Well the Pentagon has gone totally PC, they approved of putting Women on Submarines, that ought to give some real meaning to the words, Dive, dive, or up Periscope. They have overlooked the Fort Hood masacre, and the Jihadist is being treated as a common criminal. The Army recruiter shooting in Arkansas, has been completely forgotten. Yeah I can see the Hospital being made to take down the sign. They keep talking about the separation of Church and State. As WT pointed out it is not in the Constitution, anywhere. I just wonder when they will be calling all these Army Forts, racists. Especially the ones in the South, i.e., Lee, Bragg, Benning, Polk, Hood and a bunch more I can't remember. We have apporached the slippery slope. Once there the sky's the limit. Especially with this Anti-Christ living in the White House. That came from a letter from Thomas Jefferson wrote to the Danbury Bishops, trying to explain the first amendment. Steve thanks, I am always willing to learn. I appreciate it. 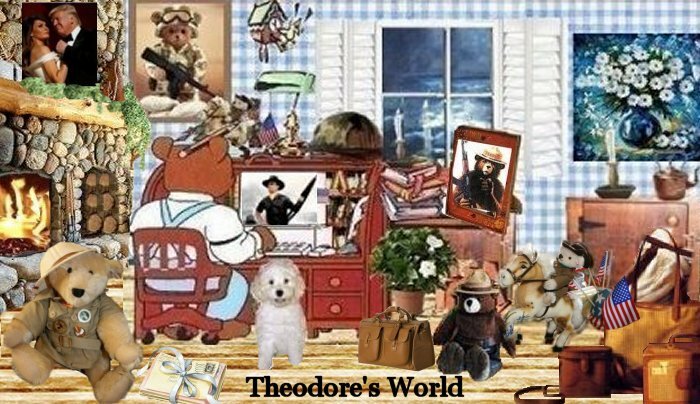 Welcome to Theodore's World blog. Bob A., they sure are, and it is breaking my heart. BobF., oh wow thanks I didn't know there were others. I agree too that this should be a wake up call to how things are getting with this. Mark, LOL about what you said about Women on Submarines. I agree with you Mark about the slippery slope.